Seattle City Light will have a third party conduct an independent investigation into the recent collapse of 26 power poles near the Museum of Flight, the utility said Monday. City Light expects to identify the third party Tuesday after signing a contract, spokeswoman Julie Moore said. Contracting out the investigation will “ensure full accountability and impartiality,” Moore said in a statement. City Light will assist by providing information, she said. “The process will include reviewing previous inspection records, inspecting the damaged poles and equipment, which have been collected and transported to a City Light facility, as well as obtaining and reviewing any available video from the vicinity,” Moore added. The utility hasn’t yet provided an explanation about why the row of poles toppled Friday along East Marginal Way in Tukwila. Some metal streetlights and traffic signals were pulled or knocked down along with the poles and live wires. 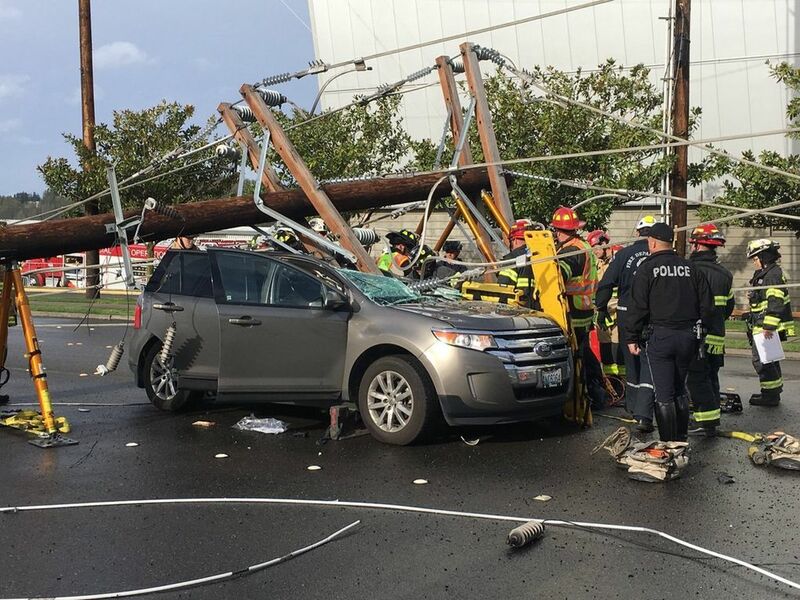 Linda and Tom Cook of SeaTac had to be rescued from their car after a pole smashed through their windshield and live wires trapped them inside. They were briefly hospitalized but somehow weren’t seriously hurt. The poles along East Marginal were inspected in 2016 by a contractor, according to City Light. Some were treated and some were identified for replacement “over the coming years,” but none were identified as in need of immediate replacement or as posing safety hazards, the utility said Monday. More than 16,000 customers initially lost power when the poles fell. All but 300 were back online within hours and most of the remaining customers had power again Saturday. City Light was still working Monday with 13 impacted customers.